What Are Social Security Wages for FICA Tax? Employers must withhold both Social Security and Medicare taxes (called FICA taxes) from all wages paid to both hourly and salaried employees. But some types of payments are exempt from FICA tax. This article discusses what wages are included in the calculation of Social Security wages and which wages are not included. What Wages Are Subject to Withholding? The IRS says that these FICA taxes are due on wages paid for "services performed as an employee in the United States, regardless of the citizenship or residence of either the employee or the employer." In other words, anyone working as an employee in the U.S. must have Social Security and Medicare tax withheld from wages. The employee's gross pay is calculated for the pay period, depending on whether the employee is salaried or hourly. The gross pay amount is used to calculate withholding for federal and state income taxes, based on the employee's W-4 form. The gross pay amount is also used to calculate withholding for the FICA taxes. The total withholding for FICA taxes is 15.3% of the employee's gross pay; the employee and the employer each contribute half. So the​ FICA withholding amount for the employee is 7.65% of gross income (6.2% for Social Security and 1.45% for Medicare). Social Security wages are used by the Social Security Administration to determine Social Security benefit calculations at retirement, so it's important that these wages be calculated correctly. This is a list of some of the most common types of payments to employees that are exempt from being included in wages subject to FICA tax. These include both Social Security wages and wages for Medicare purposes. For a complete list, see IRS Publication 15. Some "excess" fringe benefits are exempt from the calculation. Fringe benefits are taxable "on an excess of the fair market value of the benefit over the sum of an amount paid for it by the employee and any amount excludable by law." Amounts paid to employees over the Social Security maximum are also not included in Social Security wages for the purpose of calculating Social Security benefits at retirement. The maximum changes each year. There is no maximum on Medicare benefits. In addition to wages and salaries paid, some other payments to employees must be included in Social Security wages. 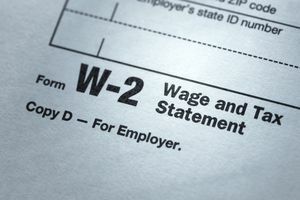 See the entire list in the general instructions for Form W-2. The list of payments to employees that are not included in FICA tax may be different from payments that are not included in income tax calculations. For example, amounts that an employer contributes to a tax-deferred retirement plan, like a 401(k) or a 403(b) plan for an employee, are not included in calculations for federal income tax. In this case, it might be that Social Security wages are higher than wages subject to income tax. All of these different types of wages are reported on the W-2 form you provide to employees in January of each year, so they can do their income taxes. Box 1, Wages, tips, other compensation: This is the amount that is taxable to the employee for federal income tax purposes. It's the amount entered on the employee's income tax form. Box 3, Social Security wages: ​This is the amount used by the Social Security Administration to calculate Social Security benefits. Tips are included in Social Security wages but are calculated separately and included in Boxes 7 and 8. Do These Wages Affect Self-Employment Tax? Self-employed individuals must pay Social Security and Medicare taxes, but in a different way from employees and their employers. These taxes, called self-employment taxes, are based on business income only. The types of income that are excluded from Social Security wages are not relevant to self-employment taxes. The types of payments that are included in and excluded from Social Security wages are complicated. There are many qualifications in the IRS regulations. This discussion is for general purposes only and should not be relied on as tax advice. Check with your tax professional before you attempt to calculate Social Security wages.